At SCC, we have a wide range of different systems to suit all of our clients needs, from conferencing, to a 1000 people seated corporate event, we can cater for our clients. RCF 710A (quantity 2) – 700w rms, 129 SPL, 10″ speaker with a 1″ HF driver. These speakers are a fantastic all round loudspeaker. These can also be used for stage monitors. RCF 712A (quantity 2) – 700w rms, 129 SPL, 12″ speaker with a 1″ HF driver. These speakers are a fantastic all round loudspeaker. These can also be used for stage monitors. 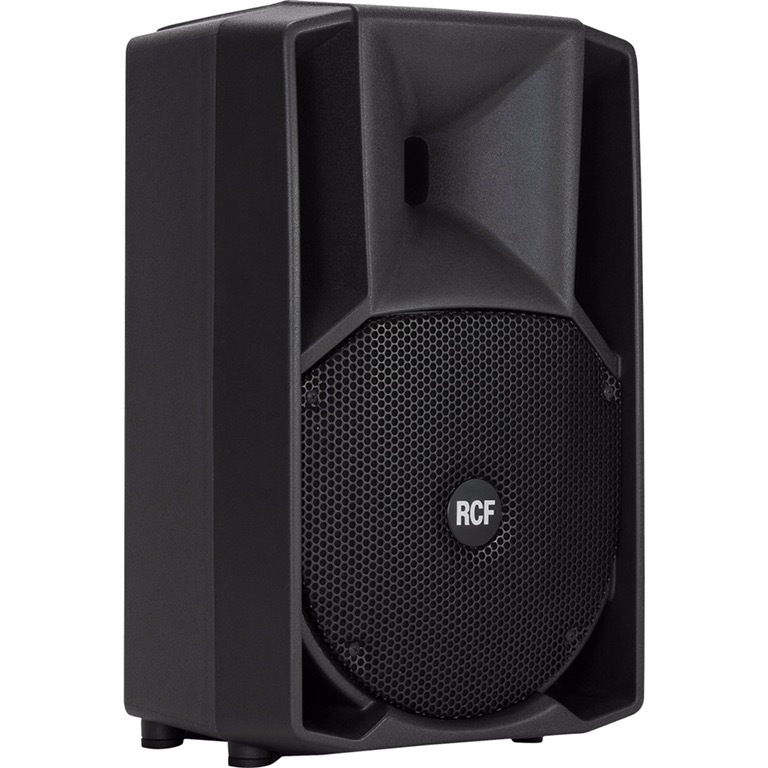 RCF 715A (quantity 2) – 700w rms, 130 SPL, 15″ speaker with a 1″ HF driver. These speakers are a fantastic all round loudspeaker. These can also be used for stage monitors. All come with protective cases. DB Technologies Ingenia IG2T (Quantity 4) – 400w, 128db SPL, 2 x 8″ LF drivers + 1 x 1″ HF driver. These speakers are a great sounding cab for all types of different applications, these are best coupled up with the DB Technologies Sub 15H (Below). This loudspeaker has state of the art DSP built in with digital steering, perfect for theatrical and outdoor applications, all accessible using the OLED display on the rear. This loudspeaker can be coupled in pairs, and can be pole mounted or flown. DB Technologies Sub 15H (Quantity 4) – 1000W (1400W Peak Power) and a high-performance 15″ woofer with 3″ coil, thanks to their unique configuration, termed Hybrid Horn-Loading, the boxes can be tuned to the lowest frequencies to improve system efficiency and convey a deep, enveloping sound. This sub has a delay system built into the amp module. We also offer a Modular Line Array & D&B Audiotechnik systems for bigger events but this system is something that we sub-hire in, and is priced on application.